The fall months are finally here and even if the calendar says that it will not officially be autumn for another few weeks, many people have said goodbye to the summer and are embracing this new season. One of the best ways that you can do that is through your aging parent’s diet. Embracing seasonal food can help your parent to enjoy a more varied, beneficial diet filled with foods that are delicious, satisfying, and packed with the peak of nutrients. During the fall season one of the best seasonal foods that your aging parent can enjoy is apples. Reduced chances of Alzheimer’s disease. Studies have shown a link between consuming more quercetin and the reduced chances of Alzheimer’s disease. 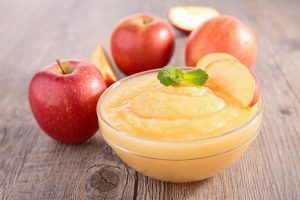 This antioxidant is abundant in all species of apples and is thought to increase the production of a certain neurotransmitter that improves memory and cognitive functioning. Lower stroke risk. Stroke is one of the most pressing risks for elderly adults. Eating apples has been shown to reduce the risk of experiencing a stroke. Reduced chances of diabetes. Studies have shown that those seniors who consume apples regularly are at a lower risk of developing diabetes. A particular study demonstrated that those who consume at least three servings of apples each week have up to a 7 percent reduced risk of developing Type 2 diabetes. Lower chances of obesity. Obesity is a severe risk factor for health complications and concerns. Eating apples as a regular part of their diet, however, can help your aging parent reduce the chances that they will become obese, and can even help them to trim down their weight. Apples contain high levels of dietary fiber. This fiber helps to fill your parent’s stomach, making them to feel fuller so that they will not eat as much. Fiber also helps the body with healthy digestion, aiding in processing the food through the body and maintaining regularity. This not only helps them to avoid obesity, but can also help your parent control cholesterol and protect cardiovascular health. If you are concerned that your elderly parent is not getting the nutrition that they need, or think that they would benefit from a more diversified approach to their care as they age in place, now may be the ideal time for you to consider senior care for them. Having a senior home care services provider in the home with them is a fantastic way for you to encourage them to eat a healthier, more varied diet while also getting the benefits of getting more connected with the food that they are eating. This can include going to the grocery store with them to help them make good food choices, helping them with meal and snack preparation, and offering them companionship as they eat to encourage them to eat better and get enough to eat. If you or an aging loved one are considering Elder Care in Holmdel Township, NJ, please contact the caring staff at Lares Home Care 1-800-781-7435 or 732-566-1112.